This one deals with fishing those juicy shelves you find in every river. Not all shelves look the same. Most are very easy to locate at the lateral top of a run, some are hidden within the run and some run longitudinally with the run. If you look closely at the video thru the link I provided, you will see a fast riffle dumping over the shelf. Look closer and you will see “sleeper seams” within the run as it dumps over the shelf. Sleeper seams show nearly imperceptible areas where obstructions gently slow the river flow. Almost a sure thing that you’ll find feeding fish holding in those sleepers, and the adjoining seams, but you’ve really got to stop and look closely. 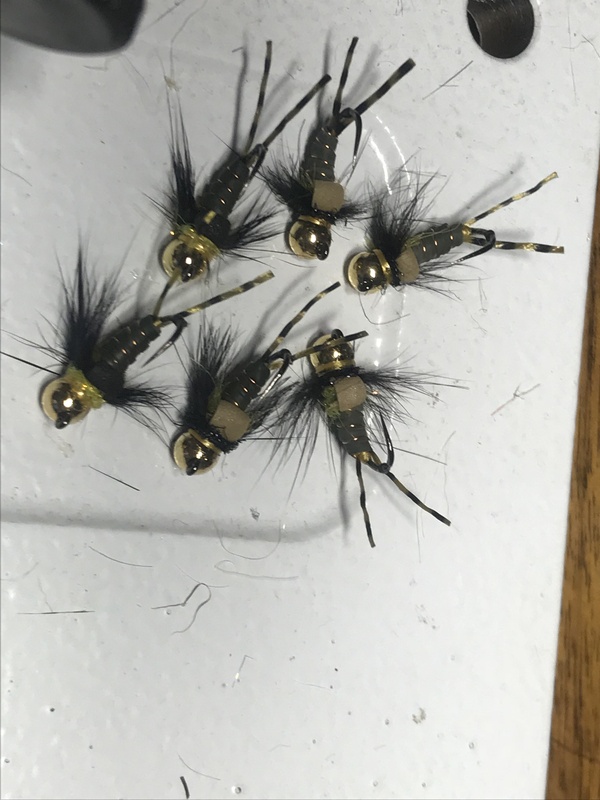 The trick is to cast up onto the fast water to place your bugs above the shelf and put them in perfect position as the water slows and drops onto the shelf. If fish are up there, they are there to eat. Make sure you’re mended up, anticipating the next mend, and primed to set quickly. Adjust your rig longer and heavier than you think you’ll need because you want your flies to follow the same path as the naturals. If you’re too light or too short, your flies will rarely drop into the proper column as the fish are below the fast water, because they are sitting in the slower flows down on the shelf. Once you really concentrate on mastering a few shelves, the formula becomes easy to figure. Sometimes you’ll see where a lateral, across the river shelf, and a longitudinal, with the river shelf connect. That situation can be pure magic as it provides multiple areas where food and fish will collide. That’s the crux of the Fly Fishing Formula. You want the fish to either eat or get out of the way. Opportunistic feeding fish will move distances to eat, selectively feeding fish will either eat or sway out of the way. They are more prone to eat if your drift is perfect and your flies are close to the naturals in size and color. Make the fish decide. Enjoy the video. Go work a shelf as soon as possible and get back to me! One of the perks from guiding is the chance to watch a lot of folks catch and land fish. Explaining to someone that has never fought nor landed a fish properly using a fly rod is like explaining a video game over their shoulder in the heat of the battle. Moves one makes intuitively or by “feel” are born out of experience of landing many fish. As guides, we can flatten that learning curve in a half day provided the fish are eating regularly, and by teaching a few basic principles. First off, it’s called “angling” for a reason. 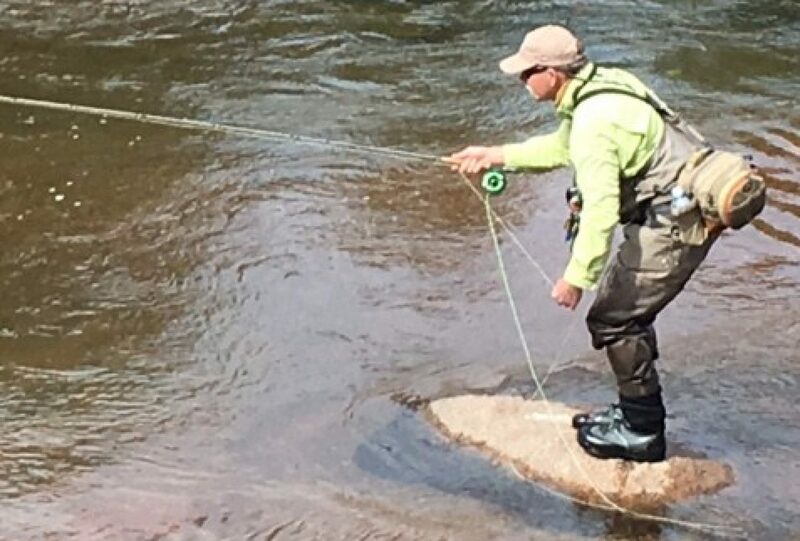 Landing fish is as much about angles and physics as any part of fly fishing. Your fly rod is a lever (class 3 I think), and also acts as a shock absorb-er. The fly reel not only stores line, but can become a smooth fish slowing drag device. For now, let’s just concentrate on the fly rod angles. After hook-up, get the fish on the reel as quickly as possible. 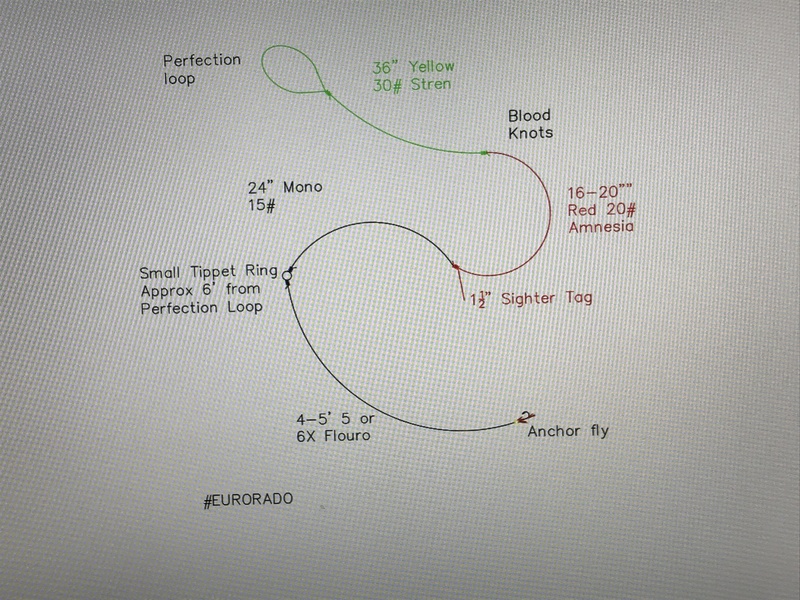 For those folks that like to “strip” fish in, no worries, I teach folks to get on the reel because it gives them one less thing to think about as they begin to learn proper landing techniques. Once on the reel, get your rod hand thumb as high as your hat brim. At this point, your rod elbow should be pointing toward the fish. Now the fun begins. I always tell folks that “now you’re in a relationship with the fish”. It’s like a dance, move-counter move. Get caught standing still, and you’re date will be gone….. If the fish “zigs”, you “zag”, keeping constant lateral pressure with the angles of the fly rod. It’s ok, when safe, to move up and down the bank to keep those working angles. As you reel and the fish gets closer, the angle of pressure on the fish should begin to be “over” the fish. In other words, lateral pressure begins to become upward/lateral pressure. This is a critical part of the land job, because as you transition back and forth between lateral and upward pressure, it’s easy to lose proper angles AND put way too much pressure on the fish. This is what I really want to point out to folks. Imagine that you’re walking your dog. You are not pulling your dog as you control it, you are simply limiting, with positive pressure, where it can go. Think of it this way, if your dog’s leash were to snap during a walk, your leash arm shouldn’t go swinging violently the other direction. This is what I see all the time. A fish will come unbuttoned, and the anglers rod arm goes flying the opposite direction. Improper angles and pressure? Yup. In the far left picture, I am keeping lateral and up pressure during the transition. If that fish came loose the fly rod would react more “up” than away, and toward the bank behind me. The goal is to make that reaction as minimal as possible. That would mean you are using the fly rod angles and pressures perfectly. Look at the picture on the right. 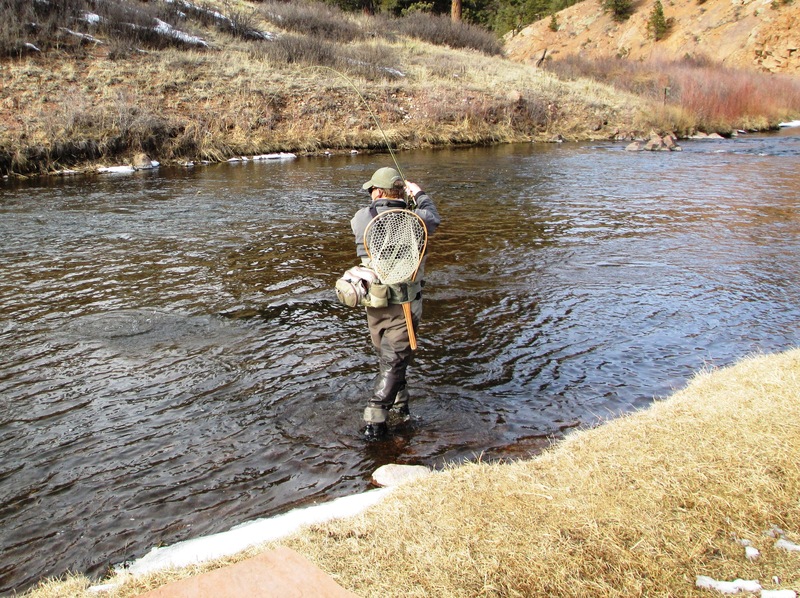 This was on a guide trip, and this client had rarely had a fly rod in hand. He was ready to land his own fish by the end of the day. If the fish were to come unbuttoned at the instant the picture was snapped, his reel and hand, if the correct angles and pressure were installed, would move to the red square position. If improper angles and pressures were installed, the the reel would move to the end of the blue line violently. It’s observable on the anglers part, and easily correctable. 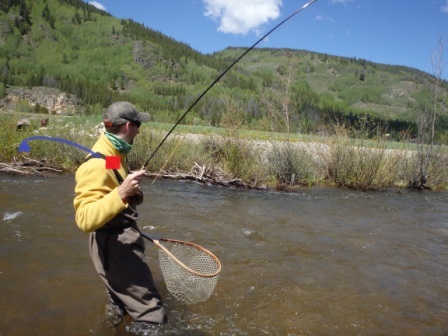 Once you get into proper fish-fighting position, the fly rod becomes Harry Potter’s wand. Move it side to side, low to high, near to far. Whatever it takes to keep constant proper pressures. I’ve a “Landing Fish” video on Youtube somewhere, and a link in my archives (somewhere). As always, feel free to shoot me questions, share this blog link, or contact me if you want to fish.